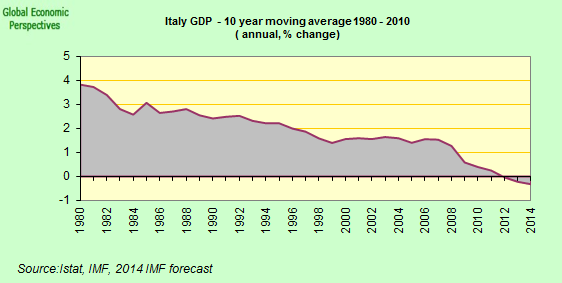 Italian retail sales fell at the fastest pace since records began (at least four years) in November as the economy slipped deeper into a recession, and consumer confidence and spending consequently deteriorated. The seasonally adjusted retail purcahsing managers index fell to 28.5 from 34.8 in October, registering the sharpest rate of contraction since the survey began in 2004, according to the Markit Economics monthly report. A reading below 50 signals contraction. 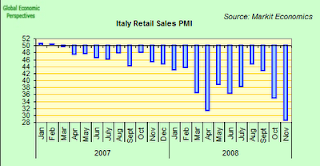 Non price corrected retail sales rose 0.5% year-on-year in September (the latest month for which ISTAT has published data) following a 1.3% fall in August. But we need to remember that once we allow for price inflation, we get a constant price real drop of 3.4% (inflation was running at 3.9% in September, see chart below for the time series). Retail sales of food products increased 1.4% in the month, although this impact was partly offset by a 0.1% fall in retail sales of non-food goods. 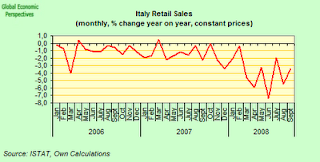 Month-on-month, seasonally adjusted Italian retail sales (non price corrected) were up 0.3% in September, following a 0.5% decline in the previous month.